This article is about the English artist and writer. For other uses, see John Berger (disambiguation). John Peter Berger (/ˈbɜːrdʒər/; 5 November 1926 – 2 January 2017) was an English art critic, novelist, painter and poet. His novel G. won the 1972 Booker Prize, and his essay on art criticism, Ways of Seeing, written as an accompaniment to the BBC series of the same name, is often used as a university text. He lived in France for more than half a century. Berger was born on 5 November 1926 in Stoke Newington, London, the first of two children of Miriam and Stanley Berger. His grandfather was from Trieste, and his father, Stanley, raised as a non-observant Jew who converted to Catholicism, had been an infantry officer on the Western Front during the First World War and was awarded the Military Cross and an OBE. Berger was educated at St Edward's School, Oxford. He served in the British Army from 1944 to 1946. He enrolled in the Chelsea School of Art and the Central School of Art in London. Berger began his career as a painter and exhibited works at a number of London galleries in the late 1940s. His art has been shown at the Wildenstein, Redfern and Leicester Galleries in London. Berger taught drawing at St Mary's teacher training college. He later became an art critic, publishing many essays and reviews in the New Statesman. His Marxist humanism and his strongly stated opinions on modern art combined to make him a controversial figure early in his career. As a statement of political commitment, he titled an early collection of essays Permanent Red. Berger was never a formal member of the Communist Party of Great Britain (CPGB): rather he was a close associate of it and its front, the Artists’ International Association (AIA), until the latter disappeared in 1953. He was active in the Geneva Club, a discussion group that appears to have overlapped with British communist circles in the 1950s. In 1958, Berger published his first novel, A Painter of Our Time, which tells the story of the disappearance of Janos Lavin, a fictional exiled Hungarian painter, and his diary's discovery by an art critic friend called John. The work was withdrawn by the publisher under pressure from the Congress for Cultural Freedom a month after its publication. His next novels were The Foot of Clive and Corker's Freedom; both of which presented an urban English life of alienation and melancholy. Berger moved to Quincy in the Haute-Savoie, France in 1962 due to his distaste for life in Britain. In 1972, the BBC broadcast his four-part television series Ways of Seeing  and published its companion text, a book of the same name. The first episode functions as an introduction to the study of images; it was derived in part from Walter Benjamin's essay "The Work of Art in the Age of Mechanical Reproduction". The subsequent episodes concern the image of woman as sexualized object in Western culture, expressions of property ownership and wealth in European oil painting, and modern advertising. Berger's novel G., a picaresque romance set in Europe in 1898, won the James Tait Black Memorial Prize and the Booker Prize in 1972. Berger donated half the Booker cash prize to the Black Panther Party in Britain, and retained half to support his work on the study on migrant workers that became A Seventh Man, asserting that both endeavors represented aspects of his political struggle. Berger's sociological writings include A Fortunate Man: The Story of a Country Doctor (1967) and A Seventh Man: Migrant Workers in Europe (1975). Berger and photographer Jean Mohr, his frequent collaborator, sought to document and understand the experiences of peasants. Their subsequent book, Another Way of Telling, discusses and illustrates their documentary technique and treats the theory of photography through Berger's essays and Mohr's photographs. His studies of individual artists include The Success and Failure of Picasso (1965), a survey of that modernist's career, and Art and Revolution: Ernst Neizvestny, Endurance, and the Role of the Artist in the USSR (1969). In the 1970s, Berger collaborated on three films with the Swiss director Alain Tanner: He wrote or co-wrote La Salamandre (1971), The Middle of the World (1974), and Jonah who will be 25 in the year 2000 (1976). His major fictional work of the 1980s, the trilogy Into Their Labours (consisting of the novels Pig Earth, Once in Europa, and Lilac and Flag), treats the European peasant experience from its farming roots to contemporary economic and political displacement and urban poverty. In 1974, Berger co-founded the Writers and Readers Publishing Cooperative Ltd in London with Arnold Wesker, Lisa Appignanesi, Richard Appignanesi, Chris Searle, Glenn Thompson, Siân Williams, and others. The cooperative was active until the early 1980s. In later essays, Berger wrote about photography, art, politics, and memory. He published in The Shape of a Pocket a correspondence with Subcomandante Marcos, and penned short stories that appeared in The Threepenny Review and The New Yorker. His sole volume of poetry is Pages of the Wound, though other volumes, such as the theoretical essay And Our Faces, My Heart, Brief as Photos contain poetry. His later novels include To the Wedding, a love story dealing with the AIDS crisis, and King: A Street Story, a novel about homelessness and shantytown life told from the perspective of a stray dog. Initially, Berger insisted that his name be kept off the cover and title page of King, wanting the novel to be received on its own merits. Berger's 1980 volume About Looking includes an influential chapter, "Why Look at Animals?" It is cited by numerous scholars in the interdisciplinary field of animal studies. The chapter was later reproduced in a Penguin Great Ideas selection of essays of the same title. Berger's novel From A to X was long-listed for the 2008 Booker Prize; Bento's Sketchbook (2011) has been described as "a characteristically sui generis work combining an engagement with the thought of the 17th-century lens grinder, draughtsman, and philosopher Baruch Spinoza, with a study of drawing and a series of semi-autobiographical sketches". Among his last works is Confabulations (essays, 2016). In 1999, Berger voiced both twin brother characters Archie and Albert Crisp in the video game Grand Theft Auto: London 1969. He was a member of the Support Committee of the Russell Tribunal on Palestine. Berger married three times, first to artist and illustrator Patt Marriott in 1949; the marriage was childless and the couple divorced. In the mid-1950s, he married the Russian Anya Bostock (née Anna Sisserman), with whom he had two children, Katya Berger and Jacob Berger; the couple divorced in the mid-1970s. Soon afterwards, he married Beverly Bancroft, with whom he had one child, Yves. Beverly died in 2013. Berger died at his home in Antony, France on 2 January 2017 at the age of 90. Seeing Through Drawing (with John Christie) (2017). The book, published by OBJECTIF, features new texts by and about John Berger plus a catalogue section of images, information and stories from the invited artists in the main exhibition held on 8 July – 26 August 2017 at Mandell’s Gallery, Norwich. It contains two previously unpublished sequences of correspondence on art and communications between John Berger and his daughter Katya Berger Andreadakis along with tributes and stories from: Anne Michaels, Yves Berger, Eulàlia Bosch, Geoff Dyer, Gareth Evans, Paul Gordon and Tom Overton. The book also features a compilation of writings on the art and practice of drawing collected together by John Christie, from across John Berger’s art criticism, fiction, essays and letters. ^ a b c d e "John Berger, Provocative Art Critic, Dies at 90". The New York Times. 2 January 2017. Retrieved 3 January 2017. ^ a b c d e f g h i j k l m n o p q r s "John Berger obituary". The Guardian. 2 January 2017. Retrieved 3 January 2017. ^ a b "I think the dead are with us": John Berger at 88". The New Statesman. 11 June 2015. Retrieved 3 January 2017. ^ a b c d e f "Contented exile". The Guardian. 13 February 1999. Retrieved 3 January 2017. ^ a b c d "John Berger: 'If I'm a storyteller it's because I listen'". The Guardian. 30 October 2016. Retrieved 3 January 2017. ^ a b c Duncan O'Connor. "Literary Encyclopedia | John Berger". Litencyc.com. Retrieved 3 January 2017. ^ a b c d e "A radical returns". The Guardian. 3 April 2005. Retrieved 4 January 2017. ^ a b c Ray, Ed. Mohit K. (2007). The Atlantic Companion to Literature in English. Atlantic Publishers. p. 48. ISBN 9788126908325. ^ a b c "John Berger, art critic and author of Ways of Seeing, dies". BBC. 2 January 2017. Retrieved 3 January 2017. ^ a b c d e f "John Berger, influential British art critic, novelist, dies at 90". The Washington Post. 3 January 2017. Retrieved 4 January 2017. ^ "Berger, John [Peter]". arthistorians.info. ^ "A Smuggling Operation: John Berger's Theory of Art". LARB. 2 January 2017. Retrieved 5 January 2017. ^ "The Many Faces of John Berger". New Republic. 30 December 2015. Retrieved 5 January 2017. ^ Parker, Lawrence (2 February 2017). "Berger and Stalinism". Weekly Worker. Retrieved 19 January 2018. ^ "John Berger, art critic and author, dies aged 90". The Guardian. 2 January 2017. Retrieved 3 January 2017. ^ a b "John Berger: Five key works by the late art critic". The Week. 3 January 2017. Retrieved 4 January 2017. ^ Berger, John (1972). Ways of Seeing. London: BBC and Penguin Books. p. 34. ISBN 0141917989. ^ Berger, John (writer) and Michael Dibb (producer). Ways of Seeing. British Broadcasting Corporation, 1972. ^ McNay, Michael (24 November 1972). "Berger turns tables on Booker". The Guardian. London. Retrieved 5 December 2009. ^ "John Berger's A Fortunate Man: a masterpiece of witness". The Guardian. 7 February 2015. Retrieved 4 January 2017. ^ "A Seventh Man: Migrant Workers in Europe by John Berger and Jean Mohr – review". The Guardian. 18 December 2010. Retrieved 4 January 2017. ^ Berger, John; Mohr, Jean; Blomberg, Sven (2010). A Seventh Man: A Book of Images and Words about the Experience of Migrant Workers in Europe. Verso. ISBN 9781844676491. ^ "ANOTHER WAY OF TELLING". Penguin Random House. ^ Christian Dimitriu, Alain Tanner, Paris: Henri Veyrier, 1985, pp. 125–134. ^ On John Berger: Telling Stories. BRILL. 2015. p. 24. ISBN 9789004308114. ^ a b c d e f "LOVE AMONG THE PEASANTRY". The New York Times. 5 April 1987. Retrieved 4 January 2017. ^ "Libros para Principiantes: Quienes somos". Paraprincipiantes.com. Retrieved 3 January 2017. ^ "Remembering Glenn Thompson". African American Literature Book Club. Retrieved 5 January 2017. ^ "Morreu John Berger, um artista (e um espectador) total". Publico. 2 January 2017. Retrieved 4 January 2017. ^ a b Hertel, Ralf (2005). Making Sense: Sense Perception in the British Novel of the 1980s and 1990s. Rodopi. p. 74. ISBN 9789042018648. ^ "Portrait of the artist as a wild old man". The Telegraph. 23 July 2001. Retrieved 4 January 2017. ^ a b McCance, Dawne (2013). Critical Animal Studies: An Introduction. SUNY Press. p. 45. ISBN 9781438445342. ^ Michelle Pauli. "Booker longlist boost for first-time novelists". the Guardian. Retrieved 2 January 2015. ^ Wroe, Nicholas (23 April 2011). "John Berger: a life in writing". The Guardian. London. ^ "John Berger dead: Booker Prize-winning author and art critic dies aged 90". Independent. 2 January 2017. Retrieved 4 January 2017. ^ "RIP John Berger, Famous British Novelist, Art Critic and Secret GTA: London Villain". Rockstar Games. 3 January 2017. Retrieved 4 January 2017. ^ "Patrons | Russell Tribunal on Palestine". www.russelltribunalonpalestine.com. Retrieved 8 January 2017. ^ "John Berger, pioneering art critic and author, dies at 90". Associated Press. 2 January 2017. Archived from the original on 3 January 2017. Retrieved 2 January 2017. ^ "Booker prize-winning author John Berger dies aged 90". The Telegraph. 2 January 2017. Retrieved 3 January 2017. ^ Bürkle, Christoph (2006). Johann Sebastian Bach: der geometrische Komponist, Issues 764–766. Niggli. p. 83. ^ Catherine Neilan (8 December 2009). "Berger picks up Golden PEN award". The Bookseller. Retrieved 3 December 2012. ^ "'From A to X: A Story in Letters,' by John Berge". The New York Times. 31 October 2008. Retrieved 4 January 2017. ^ Soja, Edward W. (1989). Postmodern Geographies: The Reassertion of Space in Critical Social Theory (illustrated, reprint ed.). Verso. p. 21. ISBN 9780860919360. ^ Merrifield, Andy (2013). John Berger (illustrated ed.). Reaktion Books. p. 159. ISBN 9781861899422. ^ John Berger, "Boris", Granta 9, 1 September 1983. ^ a b "Portraits: John Berger on Artists". www.brooklynrail.org. ^ a b Talbot, Toby (2010). The New Yorker Theater and Other Scenes from a Life at the Movies (illustrated ed.). Columbia University Press. p. 110. ISBN 9780231519823. ^ "Tilda Swinton on making 'The Seasons in Quincy', four short films about maverick artist and thinker John Berger". Independent. 15 February 2016. Retrieved 4 January 2017. ^ "The glory and the dream". The Indian Express. 13 March 2016. Retrieved 4 January 2017. ^ a b c d e f g h i j k l m n o The International Who's Who 2004. Psychology Press. 2003. p. 150. ISBN 9781857432176. ^ "A review of John Berger's Collected Poems". The Hindu. 10 October 2015. Retrieved 5 January 2017. ^ "Sense of Sight By John Berger". Penguin Random House. ^ Albrecht Dürer: Watercolours and Drawings. Taschen. 1994. ISBN 9783822885758. ^ "At the Edge of the World". Reaktion Books. ^ I Send You this Cadmium Red: A Correspondence Between John Berger and John Christie. ACTAR. 2000. ISBN 9788495273321. ^ My Beautiful. Mondadori Bruno. 2008. ISBN 9788861591141. ^ Berger on Drawing. Occasional Press. 2005. ISBN 9780954897611. ^ Hold Everything Dear: Dispatches on Survival and Resistance. Verso. 2008. ISBN 9781844672547. ^ "John Berger limited edition". www.thedrawbridge.org. ^ "War With No End". Penguin Random House. ^ "Why Look at Animals? by John Berger". The Guardian. 19 September 2009. Retrieved 4 January 2017. ^ From I to J. Actar-D Bruno. 2009. ^ Lying Down to Sleep. Maurizio Corraini. 2010. ISBN 9788875702618. ^ Railtracks. Counterpoint. 2013. ISBN 9781619020726. ^ "John Berger on 'Bento's Sketchbook'". The Paris Review. 22 November 2011. Retrieved 4 January 2017. ^ John Berger, Understanding a Photograph, Aperture. ISBN 978-1-59711-256-7. ^ Daumier: The Heroism of Modern Life. Harry N. Abrams. 2013. ISBN 9781907533327. ^ Flying Skirts: An Elegy. Occasional Press. 2015. ISBN 9780956478696. ^ "Cuatro horizontes Una visita a la capilla de Ronchamp de Le Corbusier". ggili.com. Archived from the original on 17 March 2016. ^ "Lapwing & Fox, conversations between John Berger and John Christie". www.a-n.co.uk. ^ "Landscapes John Berger on Art By John Berger". Penguin Random House. ^ "John by Jean: Fifty Years of Friendship". www.occasionalpress.net. Archived from the original on 15 August 2006. ^ "A Sparrow's Journey: John Berger reads Andrey Platonov". House Sparrow Press. Fuller, Peter (1980) Seeing Berger. A Revaluation of , Writers and Readers. ISBN 0-906495-48-2. 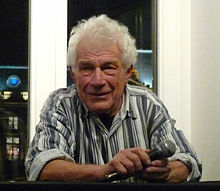 Wikimedia Commons has media related to John Berger. ^ Oliver Seidl, Michael Leu (15 May 2010). "Vom Sinn des Sichtbaren. Doktorarbeit von Jochen Krautz, Verlag Dr. Kovač 2004, 412 S". Verlagdrkovac.de. Archived from the original on 3 May 2015. Retrieved 3 January 2017.